MORTAL STRIKE is a very dedicated Teutonic 5 piece thrash metal band from Austria. 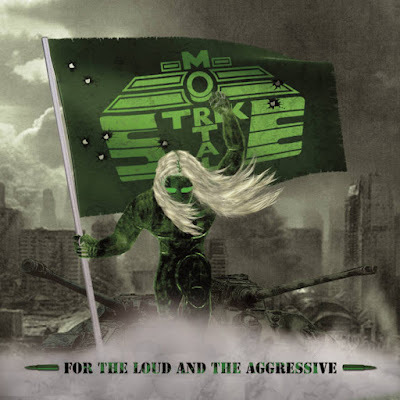 “For the Loud and the Aggressive” is a serious case for all fans of Germanic thrash metal music, which means 10 songs of pure 80’s barbaric stuff and a cover song of TANKARD’s “Zombie Attack”. Super great and fast riffs, non stop concrete rhythm section and a charismatic voice. I really love that solid sound and heavy as hell compositions. Also I adore the compilation of furious and battle lyrics along with the music. For instance I like the bolero on the snare drum on the start of “Mg42”, sounding like a machine gun and the killer voice of the singer reminds me of a war cry (calling to battle). The influences are numerous yet close to the SODOM, TANKARD and KREATOR sound and spirit. I am sure the band is killer at live shows with great thrash songs like these. The artwork on the CD is very cool and so is the logo. As I told you before this is a very serious thrash metal case and I advise you to get this album. Αναρτήθηκε από Nick Parastatidis στις 7:37 π.μ.